Born November 20, 1862, Helsinki. Died September 3, 1939 Tenhola. Besides his purely academic merits, Edvard Alexander Westermarck is acknowledged to have been a radical free thinker, certainly for his day. During his studies in Helsinki in the 1880s he was exposed through the student movement to the charged atmosphere of realism, evolutionary theory and a critique of Christian institutions. These ideas were to remain at the core of his life’s work and ideological orientation. Westermarck rejected Christianity on the grounds that it was empirically without foundation. 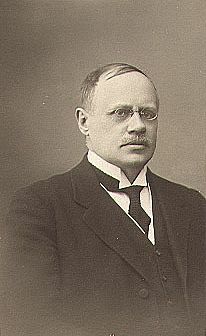 Together with his friend Rolf Lagerborg, he set up a student association called Prometheus in 1905. The association’s raison d’être was to promote freedom of religion in Finland. With Westermarck as its chairman the association demanded such things as a separation of church and state, approval of civil marriage, and an end to the practice of swearing the oath in court hearings. The Prometheus association was only active for a short period. After a decade it had all but ceased to exist, and after the 1918 Finnish Civil War it was disbanded. The state authorities had found its activity to be propagandist. Nowadays a new free-thinking association goes under the same name in the University and it also lends its name to religious and politically non-aligned camps, as an alternative to the confirmation camps organised by the Finnish Evangelical-Lutheran church, so much a rite of passage for the majority of Finnish teenagers. Westermarck was also one of the first academically-trained individuals to demand tolerance towards homosexuality, and in terms of the current social norms those of other sexual persuasions. During his time in London, he worked for two women’s organisations and showed an early interest in animal protection and nature conservation. These tolerant ideals, radical for Westermarck’s time, could be traced back to his critique of religion from his formative years. It has been claimed that…all virtue and good conduct in mankind owes its origin to the Christian religion; that it has been the main source of the moral development of Europe. I have examined the influence which Christianity has exercised both on morals in general and within various departments of social and moral life, and arrived at different conclusions. Olli Lagerspetz, ”Westermarck, Edvard”, Filosofia.fi web publication. Accessed March 18, 2015. Jouko Aho, ”Westermarck, Edvard”, National Biography of Finland online, Accessed March 18, 2015. Lars Hertzberg, ”Westermarck, Edvard”, Biografiskt lexikon för Finland online. Accessed March 18, 2015. Juhani Pietarinen, ”Edvard Westermarck. Moraalifilosofian dinosauri”, Tieteessä tapahtuu 7/1997, pp. 6–8, Helsinki 1995. Accessed March 18, 2015. Wikipedia, Prometheus-seura (’Prometheus society’) Accessed March 18, 2015. Kari Väyrynen, ”Westermarck ja eläinten oikeudet” (’Westermarck and animal rights’), in Ympäristösosiologian virrat ja verkostot. Juhlakirja professori Timo Järvikosken 60-vuotispäivänä, (’Environmental sociology – currents and networks’) Oulu 2008.